How did I get my job? The basic story is, well, basic: Early-ish in my PhD I met Geoff Goodwin at a conference; thanks to that meeting, later in my PhD I visited his lab for 4 months; at the end of my PhD we wrote a grant together and got funded; so now I’m a post doc at Penn. But. I’m a fan of metaphors and similes. Telling only that basic story is like standing in a large vegetable garden and staring fixedly at one small branch of a tomato plant. There is so much else going on! And even that one, main, plant is growing from ground fertilized with a wide variety of growth serums. But I started my psych degree thinking I would be a therapist, so, at the end of the year I applied to do a Masters of Clinical Psychology, got accepted, and set off down that path, figuring that I could do a PhD afterwards. One month into the degree (and into 2011) I changed my mind, asked Simon Laham to be my supervisor, and transferred to a combined Masters/PhD. The Masters degree was extremely good (as far as I can tell), but the main things it taught me were: that seeing a psychologist can be immensely helpful, and that I was too selfish to be a therapist myself. When therapy is successful, all credit goes to the client/patient. (As it should! They are the ones who have done the hard work of getting out of bed/changing their habits/taking their medication/making the difficult decisions about life, love, relationships.) But I wanted some credit too, I wanted to be able to say “I did this!” even if “this” was just a few pages of writing with my name on it. Research is the way to go if you want your name on things, right? The way to go if you want your name on things, though, is probably not to do what I did with my PhD. My topic was now The Moral Psychology of (Killing in) War – because I’d decided I’d wanted to focus on a “big” question – but since I still felt fondly towards my first love, psycholinguistics, I was really excited about the Linguistic Analogy for morality; the Moral Grammar that I could apply to my scenarios in order to learn something true about moral cognition. Testing the moral grammar model (in war) would be a worthy goal of my PhD. Yeah but nah. Moral grammar didn’t work out as Simon and I had expected. That’s totally fine of course; you can’t expect things to work out the first time; you can still (maybe) get those unexpected results published; and anyway, you and your advisor have probably worked out a back-up plan? My back up plan was the philosophy of war (just war theory, to be precise). I am weirdly passionate about the philosophy of war, so this plan makes some sense. But, combine philosophy with moral grammar, and you have a PhD that sits so far away from the centre of social and moral psychology that… well, they say it’s lonely at the top, but they probably haven’t been to the no-mans-land on page 205 of my thesis. Who knows how long I would have flapped around in that no-mans-land of war and misapplied metaphors, if it hadn’t been for Steve Loughnan telling me to go to conferences. At conferences, meeting other researchers working on other fascinating things, I started to discover the connections between my work and the rest of the social/moral psych world. Geoff’s work on moral character could apply to perceptions of soldiers. Kurt Gray’s work on mind attribution, likewise. Spring in the UNC garden! Kurt’s whole lab was (is!) doing exciting work on moral psychology broadly speaking, and 2 months of my 6 month visit to the U.S. later on was spent at UNC with them. Linda Skitka gave me a new (better!) perspective on the history of moral psychology and justice. Roger Giner-Sorolla and Bernie Leidner were actually interested (!!) in just war theory as well, and they already do research on intergroup conflict from an angle that fits with the rest of social and moral psychology. Perhaps I overdid it. Perhaps I spread myself too thin – somewhere in there I finished my Masters degree (including three clinical placements), spent several weeks on crutches and had a knee reconstruction, taught a couple of undergrad classes, played sports, wrote at least three papers that got rejected to death, broke up with my long term boyfriend, learnt to peer review papers, hung out with friends and family, finished my thesis (in 2016), and always, always, always caught up on sleep. Hanging out in my garden in Philadelphia, both literally and figuratively. Figuratively, it’s a bit of a shambles. Sure, as described above, the ground is fertilized with a rich mix of experiences, readings and relationships; some which contain the seeds of future projects, other which will fade away into the intellectual mulch. 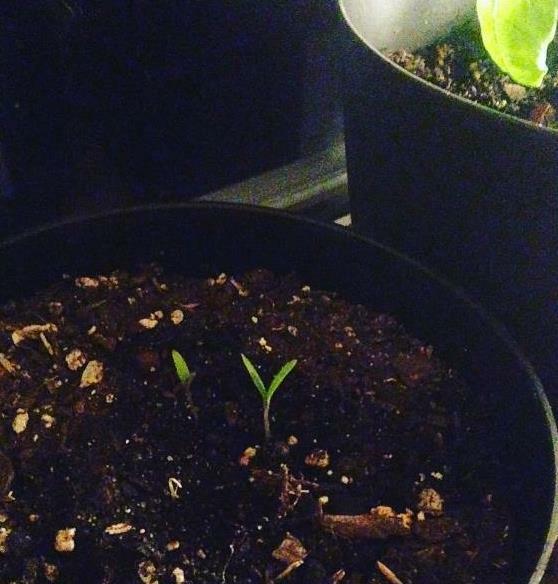 And sure, things are sprouting – among them that one tomato plant we were focusing on earlier. 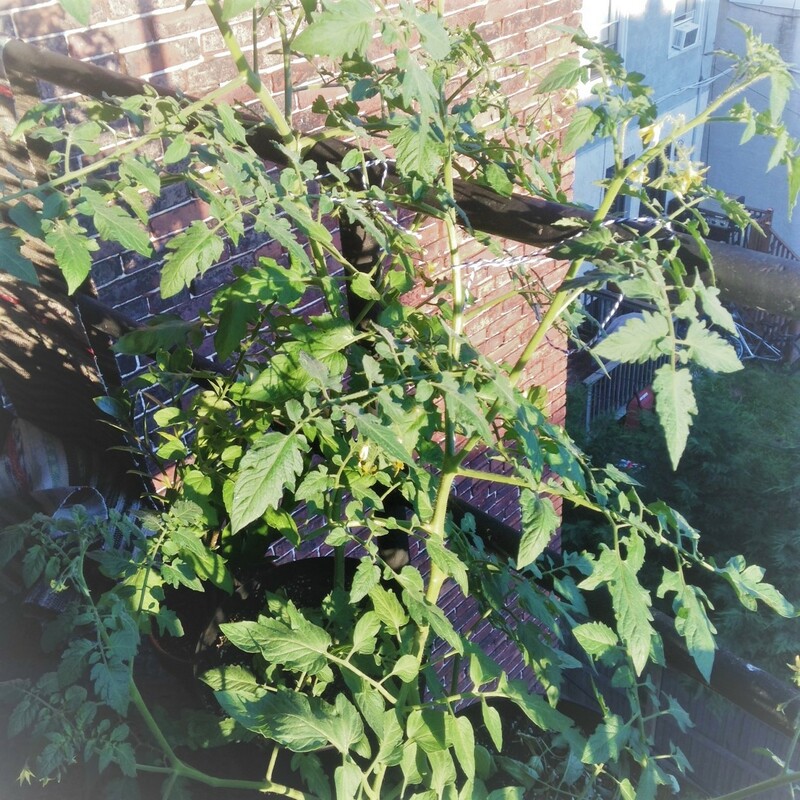 It’s not really a tomato plant; it’s a much more exotic (to me) thing called environmental psychology, and the fruit, though not yet ripe, is looking delicious. And sure, it’s a sunny, healthy place, one which I love to share with friends and future collaborators. Will it ever grow a tree? I don’t know. But I do know that I can pull out the weeds, tend to the promising seedlings, till the soil, and hope. The message here, really, is that an academic career is nothing like a garden. You might sow lots of things, but you can rarely if ever know in advance what will take root, and in which direction the plants will grow. Personally, I think that’s wonderful (the relative predictability of my literal garden is great too, see below), but it also means it’s imperative to be patient, and to ask for advice from more experienced gardeners. Oh and by the way. You can’t put your name on plants.